Welcome to our Division Facts Worksheet area. Here is our free worksheet generator for generating your own division facts worksheets related to the times tables - complete with answers. If you are looking to create your own custom-made division fact worksheets, then look no further! Here is our random worksheet generator for division facts worksheets. To start creating your sheet, choose an option from the Number values box below. Here is our free generator for multiplication and division facts worksheets. This easy-to-use generator will create randomly generated multiplication and division worksheets for you to use. Practicing multiplication/division with selected times tables. These generated sheets can be used in a number of ways to help your child with their multiplication and division table learning. Here you will find a selection of graded Division fact worksheets and long division sheets designed to help your child improve their recall of Division Facts and long division skills. 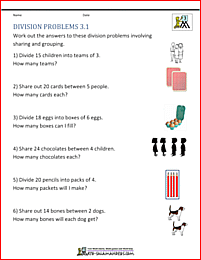 We have created lots of division word problems for you to solve. The sheets involve solving division problems in a range of different contexts and involve both sharing and grouping. 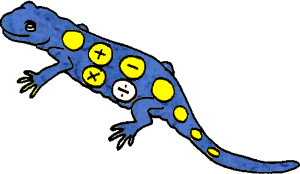 Using this link will open our 2nd Grade Math Salamanders website in a new browser window. Here you will find a selection of Division sheets designed to help your child learn their Division facts up to 10x10. Example: if a child knows that 5 x 4 = 20, then they should also know that 20 ÷ 5 = 4 and 20 ÷ 4 = 5. The sheets are graded so that the division facts start off up to 5x5, progressing on to 10x10 by the end. learn their division facts up to 10x10. All the free math work sheets in this section are informed by the Elementary Math Benchmarks for Third Grade. Here you will find a selection of Division facts worksheets designed to help your child learn to use their Division facts up to 10x10 to answer related questions. Example: if you know that 42 ÷ 6 = 7, then you also know that 420 ÷ 6 = 70 or 420 ÷ 70 = 6, etc. The sheets are graded so that the related division facts start off easier, then get gradually harder. apply their division facts up to 10x10 to answer related questions. Long Division starts properly once kids reach 3rd grade, and after they have a good understanding of what division is, and know their division facts. Here you will find long division sheets, starting from dividing a 2 digit number by a single digit, all the way up to dividing a 3 or 4 digit number by two digits. 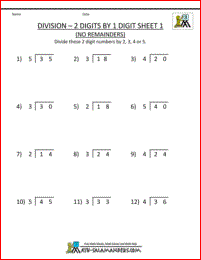 Here you will find a selection of free Division Worksheets 3rd Grade which are designed to help your child understand how to do long division. The sheets are graded so that the easier ones are at the top. Here you will find a range of Long Division sheets which are designed to help your child master their Long Division by a single digit. use long division to divide a range of numbers by a single digit. All the free Math work sheets in this section are informed by the Elementary Math Benchmarks for 4th Grade. Here you will find a selection of free Division Worksheets designed to help your child learn to do 2 digit long division. The sheets are graded so that the easier ones are at the top. divide a range of 3,4 and 5 digit numbers by two digits. All the free math work sheets in this section are informed by the Elementary Math Benchmarks for Fifth Grade.